J IT requires that the plant layout be designed to ensure balanced workflow with a minimum of work in process. This means that we must view each workstation as an integral part of the overall production line, whether or not a physical line actually exists. Capacity balancing is done using the same logic as for an assembly line, and operations are linked through a pull system (described later). This also means that the system designer must have a vision of how all aspects of the internal and external logistics system are related to the layout. Consequently, the concepts of supply chain management are integrally linked to JlT. Preventive maintenance is emphasized to ensure that a continuous workflow is not interrupted by machine downtime or as a result of poor quality from malfunctioning equipment. Much of this maintenance is carried out by the operators because they are responsible or the quality of products coming off the machines, and also because of their sensitivity to the idiosyncrasies of the machines as a result of working on them day in and day out. Finally, the fact that the JITphilosophy favors man simple machines rather than a few complex ones enables the operators to handle routine maintenance activities. education in setup changeover time and lot sizes are interrelated and are key to achieving a smooth flow (and JIT success in general). 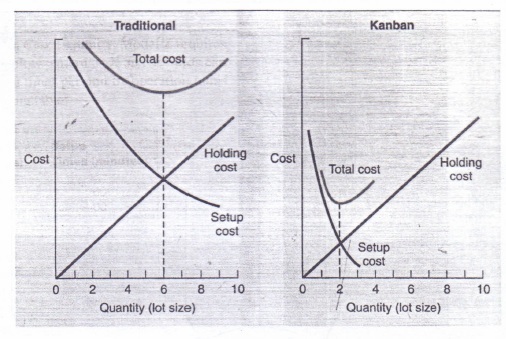 Exhibit 14.11 illustrates the fundamental relationship between lot size and setup cost. Under the traditional approach. setup cost is treated as a c constant and the o optimal order quantity is shown as six. 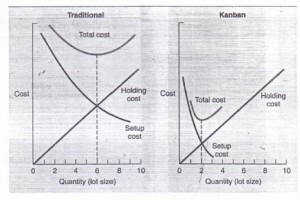 Under the Kanban approach of JIT, setup cost is treated as a variable and the optimal order quantity. in this case, is reduced to two. This type of reduction can be achieved by employing setup time-saving procedures such as those described earlier in the chapter. The ultimate goal of JlT from uninvented ry standpoint is Too achieve an economic lot size of one. Even though we already have described the various types of layouts in Chapter 8, we briefly will describe a line flow operation and a job-shop layout to show how JIT can be applied. Most people think of high-volume assembly lines when they think of JIT. This is because most of the literature and discussions on this topic have been about line layouts. However, job-shop environments. where functions are grouped together, offer perhaps the greatest benefits for JIT application.In assembly or fabrication lines. the focus is on product flow. Volumes may be high enough or tasks simple enough or cost low enough so that the required resource- (people. machines, materials, etc.) 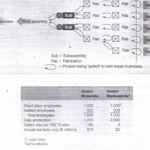 can be arranged close together in a simple flow.The majority of manufacturing plant" are process oriented. being organized b) function (i.e .. similar machines are grouped together). Many service facilities also are organized by function or process: hospitals. universities, department stores. and so forth. The main reason for this organization is because these machines or processes serve a variety of needs. none of which is large enough to justify a machine of its own. In this environment. the product or person requiring service must move longer distances.